Adopting an adult cat? Awesome! An adult cat poses different challenges than a kitten. 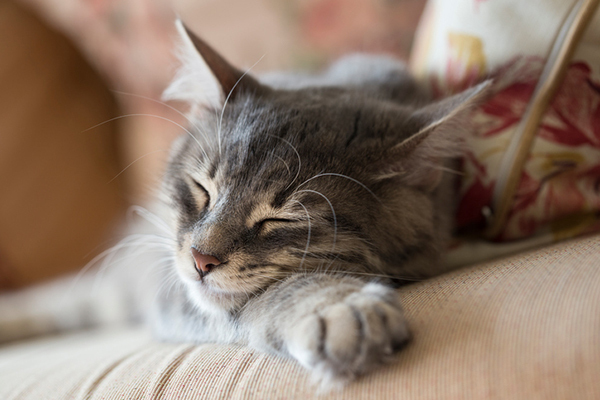 Behaviorist Marilyn Krieger highlights a few issues you might encounter when adding an adult cat to your home — and how to overcome them. 1. Newly adopted cats often hide and shun their new people. 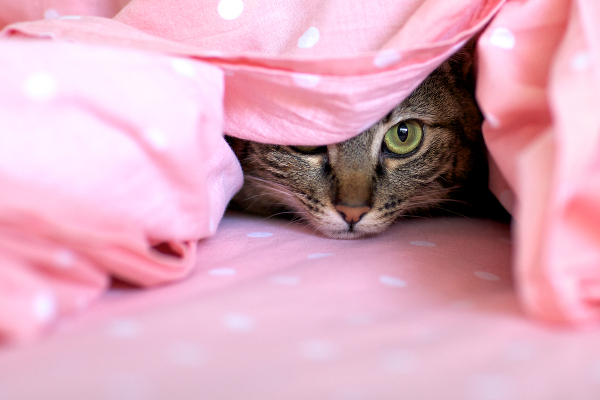 Adult cats might be more prone to hiding when you first adopt them. Photography by Julie Vader / Shutterstock. 2. Resident cats commonly fight with newcomers. 3. The new cat doesn’t want to be petted. 4. The new cat won’t eat. 5. What can new owners do to stop unwanted behaviors? Cats always have reasons for their behaviors — they don’t happen in a vacuum, Marilyn says. “Many things cause unappreciated behaviors — medical issues, history, poor litter box management, household turmoil, how the cat is approached and handled, inter-cat issues and many others.” Any behavior change requires a visit to the veterinary clinic. Tell us: Have you ever adopted an adult cat? What challenges did you face? How did you acclimate him to your home and other resident cats? I recently started working from home a few months ago after years as a road warrior and was thrilled that I could finally have pets. I took in a friend’s 2 year old female rottweiler with hind leg problems. She is young and active but only to a degree because of her hind legs. Now another friend has asked me to take in her 13 year old female ragamuffin as her child cannot be around it, so she is home with me on a trial basis. The dog has lived with cats and when we meet one at the vets or on a walk she is interested but not overly so. Just wants to sniff and then forget about them. The cat is very sweet but has never been around dogs and seems terrified. I have them separated, but wonder if this will work out. I am more worried about the cat adapting than the dog. My cat adopted me! I’ve been putting out food for the ferals in my backyard for over four years. When winter came, I got a shelter from a rescue organization. A second and third joined it. Meanwhile, “Soot” started escorting me from the backyard to the side door and it wasn’t long before he was watching for my husband to leave for work in the morning. As soon as Hubby was gone, he’d be sitting on the side door stoop, waiting to come in. He’d go back outside for breakfast, but as soon as he was done eating, he’d be scratching on the door. If Hubby came home early, Soot would wait until he wasn’t looking and streak for the exit. Once he got used to the house, he pretty much curled up by the heating vent in my office and slept all day. He preferred to go outdoors rather than use a litter box, but as soon as he was done, he’d be back at the door. Then he stepped up his game last summer. If it was pouring rain, he’d leap from the back gate to my office window sill and peer in, looking pathetic. Hubby reluctantly allowed him indoors to wait out the weather. And it wasn’t long before the ‘basement rule’ fell by the wayside. Last November, I needed a relatively minor surgical procedure. I arranged for the neighbor kids to feed the ferals. My mother came in for a few days to help me recuperate. My first day home, she went to the bakery. When she came back, Soot was on the front step. And when she walked past him to open the door, he raced inside, looking for me. It took a couple of weeks more before we made the appointment, but that was only because I wanted to make sure I could get him into the carrier first. We found out he had some minor issues (eye infection, behind on vaccines) and a major one (FIV positive). And he needed dental work. We took care of it. I’m positive that he must have had a home at some point. He’s adjusted too well not to have. At some point before we met, he was TNR’d and he spent three winters in one of my shelters, so I know I haven’t abducted anyone’s current pet. And he’s extremely vocal, which is unusual for a true feral. These days, he’s loving, playful, getting better around new people all the time, and in the best health he can be, all things considered. I adopted a wonderful blackish-brown cat (Burmese?) who is a spayed and declawed female and is 8 years old. From the beginning, She has been very affectionate and playful with me, but even after 12 weeks, she rarely leaves the bedroom and is fearful of my husband. He is soft-spoken around her and always offers her treats and toys, but she hides from him. I also have several pheromone dispensers around the house. Is there anything else I can do to help this cat overcome her fear of both the main part of the house, and of my husband?? I’ve had cats most of my life, but they have all been younger. Was I wrong to try to adopt an older cat who may have a history that I can’t understand or overcome? Thank you! You were not wrong to adopt an older cat. It is amazing to adopt, regardless of how old a cat is. You can help minimize her fearful behavior! We moved into a house where my brother’s cat lived for 6 years about a year ago. My cat gizmo started spraying in a few areas and in the past 3-4 months it got worse! He would spray on vertical surfaces around the house. I used the pheromone spray to calm him down. Cleaned the soiled areas real good. Kept all doors closed. I couldn’t take it anymore so I just brought him to the vet and health issues were ruled out. The vet prescribed some progesterone pills that I have yet to give him so he’s not anti-territorial. Today, I converted our master bath into his “home” with his stuff. He seems comfortable and I will slowly expand over time after he stops spraying in there. This is my first step to change the environment. Do you have any advice here or anything else? Seriously, take your cat to the vet like yesterday. All the new, non-allergy symptoms could be due to something treatable. That much weight loss and behavior changes are big read flags that he needs to be checked out. We adopted a year old cat from a breeder and had him neutered. Six months later we got a 12 week old kitten. We have gradually introduced them over the last two weeks. They run and wrestle constantly- I guess this is just normal- but the older kitty has a defect in his nose and tires more easily so I separate them after 30 minutes- do this about 2 or 3 times a day.All this wrestling seems pretty intense and I am afraid one will hurt the other- so far no one has cried out. Should I be concerned? I adopted 2 adult cats just over a year ago. I was intending to get just one but they were best buddies at the rescue Center so ended up with both! One was about 2 and very shy, he hissed and hid when I met him. The other is older and as friendlier. As I live on my own in a small house they had the run of downstairs when I first brought them home but didn’t go upstairs. Mark (the older cat) soon settled and within a few weeks was sitting on my knee. He now runs to greet me when I come in, sits on my knee the minute I sit down and sleeps on my bed! Kitkat the younger cat hid under a chair for the first couple of months only coming out when I was in bed or at work. Gradually he started coming out at feeding time and in the evening, but would come nowhere near me. I used to sit on the carpet and make a fuss of Mark and play with him and I think that helped Kitkat gain trust in me. At this point I let the cats have the run of the house. It took about 7 months before Kitkat would let me stroke him in his bed and a little longer before he sat by me on the sofa. He is now a real snuggle bug and cuddles up quite happily. Once Kitkat became comfortable in my company I installed a cat flap and they both come and go as they please. Kitkat loves being outside and is becoming quite the hunter! Mark tends to laze around and not go too far. They are still best friends. My cat Snowball has those allergy scabs. It is so terrible. Touching him make me cringe. It has improved. Snowball is about 13 years old. Lately he want to sleep with me, he has to be touching me or he get cross and hisses, even bites if I try to move him. He has never hissed, scratched or bitten before. Also he use to be a fatty. Now he is getting skinny, I can feel his bones, his eyes are red around lower and upper lids. I he dieing?I think he is. Please take your cat to the vet ASAP. It sounds like he has something serious! Hope he feels better.